Are you kidding me? This is my answer to all those times when it was much easier to pick up the phone and order in pizza instead. 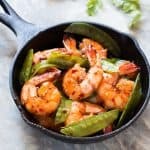 I’m talking 5 ingredients in these insanely delicious Honey Chilli Garlic Tiger Prawns and exactly 8 minutes to make them! I think you are going to be seeing quite a few of these 5 ingredient/ 15 minute/ under 30 minute/ one pan meal kinda business around here in the future. You see this month is just busy busy busy. We are moving houses which means first searching for a house, finding ‘the one’ and then packing all of the 152 boxes that I know we are going to have, to move! In between all of this, we are also attending Denver’s cousins wedding so yaaaaaaay quick party and then we are back! Guys these prawns are crazy delicious! And they only need a sprinkle of this and a spoonful of that, and before you can say tiger prawns they are ready! It’s a classic combination for seafood – honey, chilli flakes and garlic! I threw in some snow peas right towards the end so that they could just sizzle a bit and not get all squishy. But you can totally add whatever vegetable works for you. I love adding broccoli, mushrooms, even beans or bok choy. Anything green is the best! They are not so much soupy or saucy. But there is enough at the bottom of the pan to just coat your noodles or rice slightly. This can’t be categorised as thai or chinese or korean. I think it’s just a simple asian stir fry that is so perfect for quick dinners when you want something satisfyingly homemade but don’t have enough time to cook dinner! Are you with me on these quick dinner options? If you are figuring out too many things in your life too and just want some quick dinner inspiration, check out my One Pan/30 Minute Meals board on Pinterest. Looking for meals under 15 minutes? 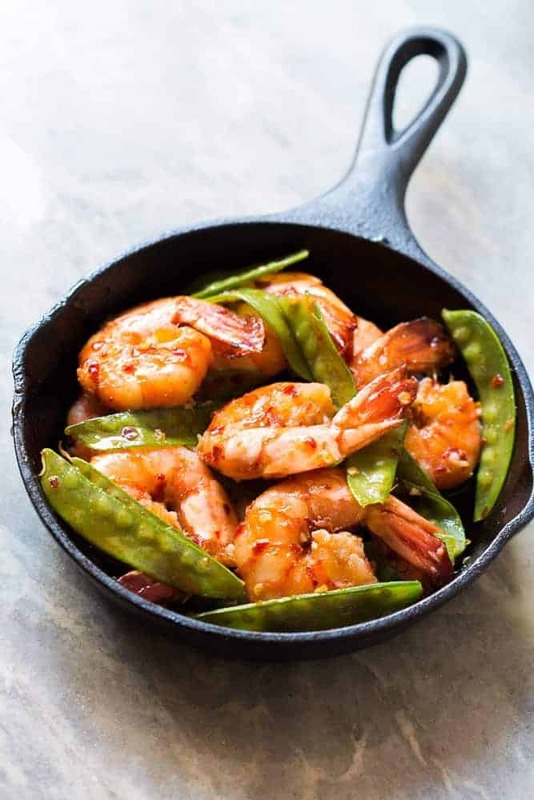 This is it – 5 ingredient honey garlic chilli tiger prawns! All the asian flavours you love in this one easy recipe! Add tiger prawns to a bowl and add chili flakes and garlic paste to them. Mix and let them sit for 5 minutes while you prepare your snow peas or any other vegetable you are using. 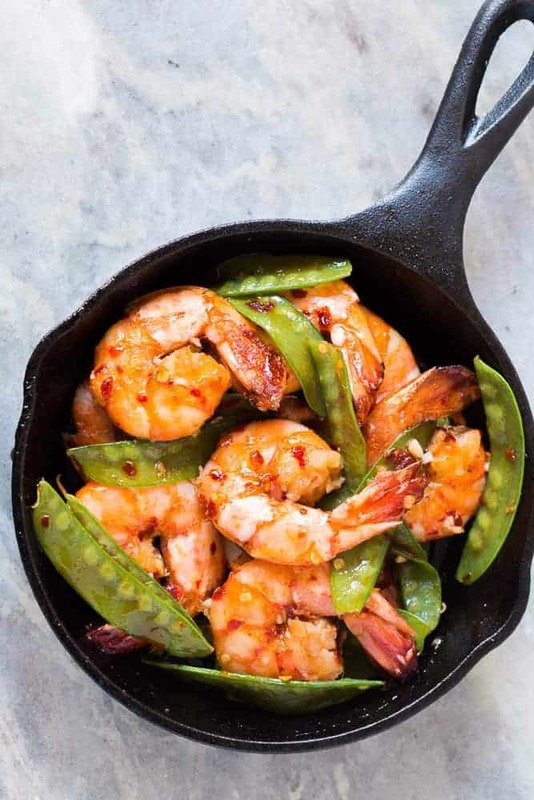 Heat oil in a skillet or pan and add the tiger prawns. Stir fry them for 4-5 minutes and add honey, 3 tablespoons water, snow peas and salt. Because of the honey, it should start becoming a little saucy. Switch off the flame after a minute or two, just as soon as the snow peas look slightly steamed and become a bright green. 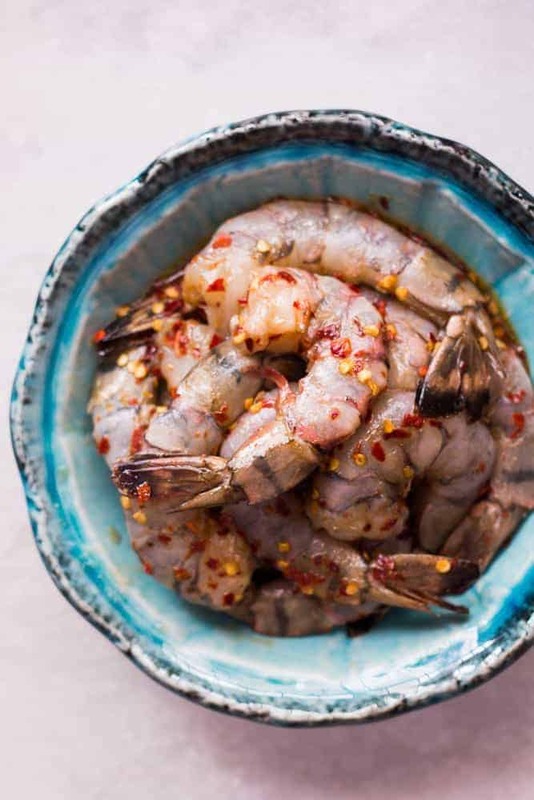 Serve these 5 Ingredient Honey Chilli Garlic Tiger Prawns with some rice noodles or just plain steamed rice. It’s total yum! I used onions instead of snow peas. Just waiting for Sunday. The nicest part is that the list of ingredients is unbelievably small. Way to go Richa. Enrich us with simple and easy-to-prepare dishes.